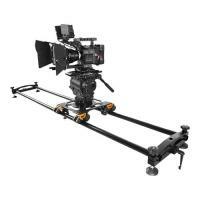 Came-TV has added the portable SLO04 to its slider range. The CAME-TV SL04 Slider comes with a 75/100mm half-shell mount (optinal 150mm), offers a max payload capacity of 50 kg and can be built up to a length of max 201 cm by means of bolt-on aluminium rails. The individual rail segments measure 67 cm per piece. The dolly glides on an 8-wheel system - the construction is known from a whole series of other sliders. If we have seen it correctly, the end-pieces also have threads on the underside, so that mounting on two tripods should be possible. The price of 698.00 USD also includes a Transportbag.